Developer Week: Summary Day 3 - OMG! Ubuntu! It’s sad news, yes – Ubuntu Developer Week for the 12.04 cycle is over. It’s been three fantastic days full of action-packed sessions. If you couldn’t attend, check out the logs of the sessions, all of them are posted on the UDW page. Fixing Desktop bugs — seb128S bastien Bacher kicked off our last day. At first he took some time to explain how the Desktop team works and how they go about fixing bugs, then he took a quite recent example and explained how to work all the individual packaging bits to fix a Desktop bug in Ubuntu. For bonus points he explained how to get Wanda the Fish working in Ubuntu. Triaging Desktop bugs — om26erNext up was Omer Akram, who first gave us an update about his personal life, then quickly dived into triaging bugs. He explained all the actors involved, what to bear in mind and general things to make sure when you are reviewing bug reports. Omer, who started out by triaging bugs himself, did a great job explaining how to get involved and why it’s so important. Simple Lenses with Singlet — mhall119Michael Hall, an unstoppable force throughout UDW, provided a great session about how to write lenses for Unity using Singlet. For developers who have used Python in the past, this might be an even easier (and more pythonic way) to interact with Unity and Desktop bits. Those of you venturing into the land of Ubuntu development will have to deal with packaging and it’s good to do it in a safe, clean and reproducible manner. Stefano Rivera explained a lot of options for doing that including some advanced features useful if you want to debug builds. Great work. Again for those of you interested in package maintenance: it’s important to document your work properly. You don’t want anybody (including yourself) having to go back in a few months or years and dive into the archaelogy of a package to understand what exactly was changed and why. Bhavani Shankar shared his experience in writing crisp changelog entries. 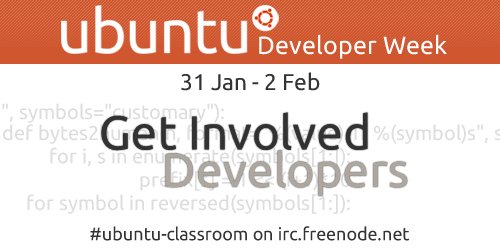 The Ubuntu Documentation project is of vital importance to everyone who is new to Ubuntu. Also is it a great way to get involved with Ubuntu, as Jeremy Bicha showed. He explained how to the team works generally and how to actually go and contribute improvements. If you want to allow you application to sync data to the internet, it never was easier. Stuart Langridge showed and explained some easy examples which demoed how to tie in Ubuntu One services into your app. Dustin Kirkland did an impressive live demo of how to use EC2 to do pair programming, review of code and builds. He used tmux and byobu and explained in detail how to drive the infrastructure. Unfortunately the log is a bit colourless without the live demo right next to it. Nothing stops Stuart Langridge when he’s on a roll. He delivered his second session all about the new Ubuntu One Database. For those of you new to the initiative: “U1DB is for syncing data — that is, something structured — to every device you want”. The session is short, has lots of good information in it and a nice example of how to work with it. James Westby gave a great introduction to the pkgme project he has been working on and it’s fantastic to see that a lot of repetitive tasks are done by a tool. It was nice to see pkgme package itself. Give it a whirl and let James know how it works out for you. G bor Kelemen is one of the heroes of Ubuntu’s internationalisation. Keeping all packages translatable and translations in shape matters deeply to him and he gave a nice overview over how common problems can easily be resolved. K sz n m G bor! Andrea Colangelo took over and quickly ran us through a couple of examples of fixed bugs and explained how exactly they were fixed. By the end of the session it was clear that in a lot of cases it’s no rocket science to go and fix a bug. Grazie mille, Andrea – I hope many will find your session as encouraging as we did. Charles Profitt delivered the last session of the event and explained how all teams in Ubuntu work together to go from problem to solution, involving the lifecycle of a bug report, which was a big enough topic on its own already. Throughout the session he showed how you can join each of the teams and make a difference. Awesome! David Blangstrup Please tell how to remove the annoying 'recent' and 'starred'! Marco Missere The base for Mint 19.2 is Ubuntu 18.04 LTS.